VP Racing Fuels are a big deal over in the States - A household name and recognized by many as the world leader in race fuel technology, with a catalogue of nearly 70 fuel blends and a growing roster of VP-fueled champions across the entire spectrum of motorsports. As you can imagine, once their reputation began to spread internationally, we were pretty keen to get their products on the shelf at Opies. We were especially interested in their potent range of fuel additives, designed from the ground up to get the most from your engine. VP Racing Fuels was founded by Steve Burns, who initially exhibited his aptitude for R&D in the early 1970�s as a young racer in San Antonio, Texas. Steve was convinced the race fuel manufacturers of the day were falling short in their quest for optimum horsepower. To address this shortcoming, he began experimenting with exotic blends of fuel. Over time, this led to the development of their fuel enhancers and additives, or "madditives" as they are better known. Whether you are after an all-in-one diesel conditioner, octane boost for your race car or even an entire fuel system cleaner that will cover you for 5000 miles, there will be an additive that is designed to exceed your expectations. Have a look through the list below for the new products in this range, simply click on the product of interest for all details. Prices shown include your 10% forum discount code, which can usually be found in the signature. You can find the full range of Madditives HERE, and the entirety of our additives HERE. 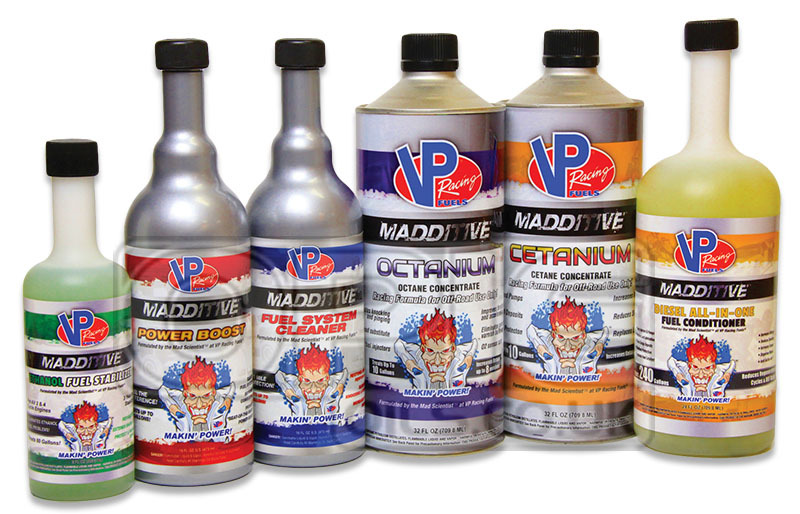 We're pleased to welcome these to the team, VP�s �Madditive� line of performance chemicals for automotive applications is engineered to improve performance as well as save you money at the pump and at the shop. VP�s reputation for quality and performance set this line apart from the competition, offering results that simply can't be found elsewhere. We're sure you'll find a product that really enhances your driving experience. Should you need any advice on the correct product for your particuar application, please feel free to give us a call on 01209 202 944 or drop us an email to sales@opieoils.co.uk and we will be happy to help. We're here Monday to Friday 8:30 - 5:30.